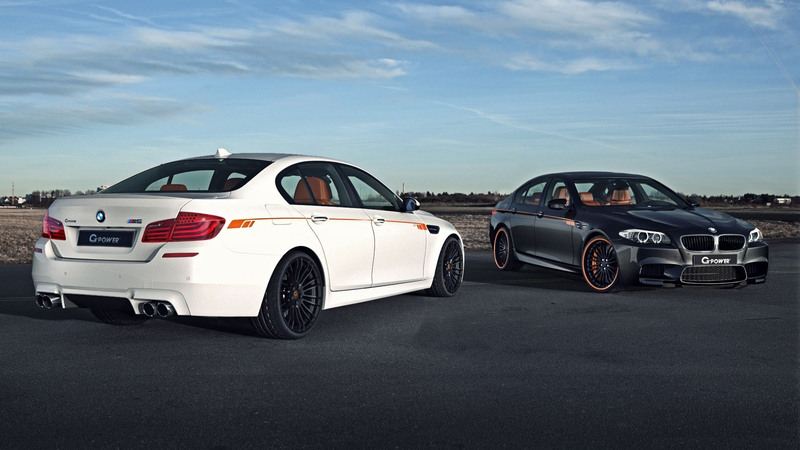 These two 2012 BMW M5 F10 cars are modified by G-Power. G-Power has added the Bi-Tronik III package on these cars. Now, each car can produce up to 640 hp (471 kW) from 6000 rpm to 7000 rpm and up to 573 lbs-ft (777 Nm) of torque at 1500 rpm. So basically, the new package has added +80 hp and +72 lbs-ft of torque. The 2012 BMW M5 F10 with a Bi-Tronik III package can accelerate from 0 to 100 km/h (0-62 mph) in only 3.9 seconds. Top speed is 195 mph (315 km/h). G-Power has added 21 inches Silverstone Clubsport forged wheels and 21 inches G-Power Silverstone RS wheels. Customers have an option to choose between those wheels. The entire G-Power BMW M5 upgrade package would cost you about 40600 Euros or about 56,000 USD ($). However, it is also available as individual accessories. Wheel and tire package would cost you about 8,300 Euros. GM5-RS coil-over suspension would cost you about 2,170 Euros. Ceramic braking system for the front axle would cost you about 14,450 Euros. Ceramic braking system for the rear axle would cost you about 11,750 Euros. Bi-Tronik III engine upgrade including individual tuning would cost you about 3,900 Euros. The black and the white 2012 BMW M5 F10 looks great. Both cars now have some new looks (minor) and extra power, because of the new G-Power BMW M5 upgrade package. Is it worth it about 56,000 USD ($)? Well, that strictly depends on you and your needs. If you own a BMW M5, and you think that this package is for you, go and buy it. However, if you think that it’s not worth it, well, save your money for something else.